The mascot of the Duke Blue Devils performs against the San Diego State Aztecs during the third round of the 2015 NCAA men’s tournament at Time Warner Cable Arena on Sunday in Charlotte. Duke won 68-49. Pretty much every team that survives its first two games and advances to the Sweet 16 has the right to be pleased with its performance. But four men’s teams — Duke, Arizona, Michigan State and Gonzaga — should be especially giddy. Their odds of winning the championship have improved the most so far. In the table below, I’ve compared the 16 surviving teams in two ways: First, by the change in their power rating in the FiveThirtyEight forecast since before the tournament began, and second, by the change in their probability of winning the tournament. Teams’ power ratings can change for two reasons. Our model updates the power ratings at the end of each game based on how a team performs relative to its expectations. A team that wins by an especially wide margin, or that wins as an underdog, will see the largest gains. 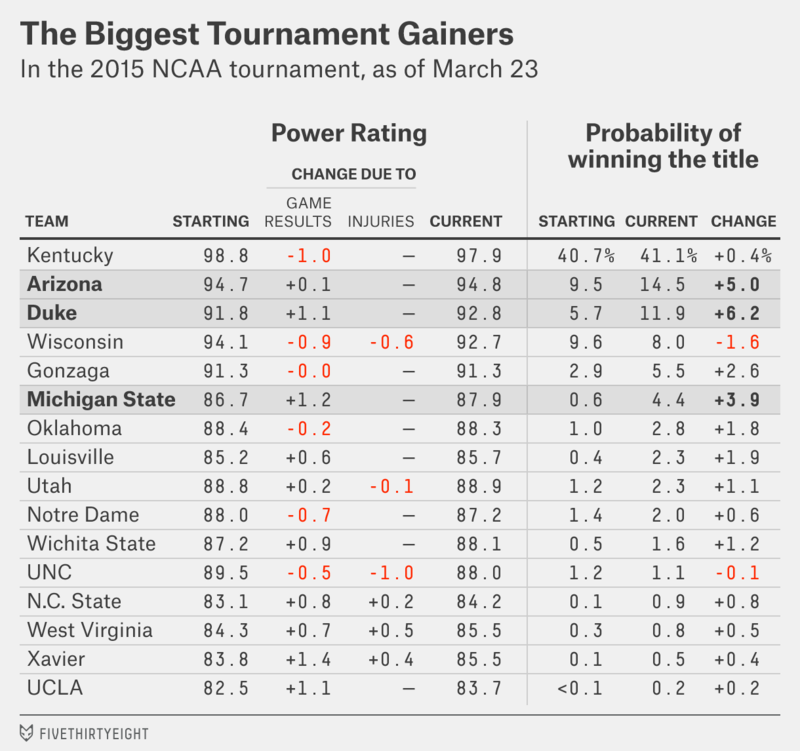 By contrast, a team’s power rating may decline if it wins by a smaller-than-expected margin. We’re also continually updating the model with new data on player injuries. Two injury situations are the most critical so far: North Carolina’s Kennedy Meeks’ Sweet 16 status is uncertain after he hurt his knee in the Tar Heels’ Saturday win against Arkansas. And Wisconsin point guard Traevon Jackson has yet to play despite hopes that he might have returned. Apart from the changes in its power rating, a team’s chances of winning the tournament can change because its draw becomes harder or easier. Michigan State’s probability has improved not just because they beat Virginia, for instance, but also because the No. 1 seed in the East region, Villanova, was ousted by North Carolina State. Duke’s championship probability has roughly doubled to 11.9 percent from 5.7 percent. The Blue Devils won their first two games easily, and they were helped by losses elsewhere in the bracket, especially to Iowa State, their one-time potential opponent in the Elite Eight. Arizona’s chances have improved to 14.5 percent from 9.5 percent. The Wildcats have also been helped by an upset: Instead of facing No. 3 seed Baylor in their Sweet 16 game, they’ll get Xavier. It helps, too, that Wisconsin, Arizona’s potential Elite Eight opponent, has not looked as strong as the model had them originally. Gonzaga won easily on Sunday against an Iowa team that looked excellent in its opening game. Its path has also gotten easier because of the elimination of Iowa State, a team they could have played in Sweet 16. Instead, they’re 75 percent favorites to win their grudge match against UCLA. By contrast, Wisconsin and North Carolina’s probabilities have declined slightly, partly because of their injury issues and partly because Arizona looms large in the West regional, which will be played in Los Angeles. Wisconsin also played a closer game against Oregon than the model expected.